The Volkswagen E-Bugster concept has just been unveiled in the lead up to the 2012 North American International Auto Show in Detroit. It features a fully electric powertrain, and a ‘chop-top’ roof design taking inspiration from the Volkswagen Ragster concept of 2005. Showcasing a sleek body similar to the Ragster, the E-Bugster concept features a roof that is lowered 74mm compared with the normal Beetle. The E-Bugster also gets a smooth wrap-over roof design giving the impression that it is a convertible. Under the bonnet lies an electric motor producing 84kW of power and 270Nm of torque. Electricity is sent from a 315kg lithium-ion battery mounted in the rear of the concept. Its full-charge range is approximately 160km. Recharging can be done via a 120-volt or 240-volt socket, while a quick-charge system recharges the battery to 80 per cent in just 30 minutes. 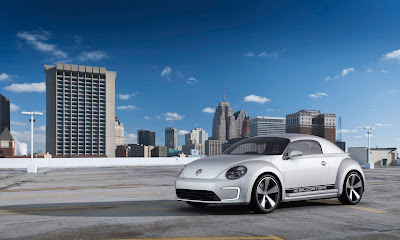 Other revisions over the normal Beetle include new front and rear bumpers, LED daytime running lights, and a set of 20-inch five-spoke alloy wheels. There are no plans for the E-Bugster to go into production any time soon, but the concept showcases technology that will eventually wind up in production Volkswagen vehicles in the near future.